Despite going on to secure worldwide fame as an inventor extraordinaire, Edison was a school dropout. He had trouble concentrating due to his inquisitive mind, leading to his teachers thinking there was something wrong with him. Edison's most famous inventions are the phonograph and the paradigm-shifting design of the electric light bulb. Contrary to popular misconception, Edison didn't 'invent' the electric bulb; several designs had been made to that effect before Edison. Edison's design, however, stood out due to it being the most practical and the most efficient. His first inventions included an electric vote recorder and a stock ticker. When Edison was nine years old, he received a book on physics. Even at that tender age, he did not believe all the experiments in the book until he had tested them himself. He used the basement of his house to carry out all the experiments. Later, he constructed a makeshift lab in a train carriage. Thomas Edison was partially deaf. At least three separate reasons for the deafness have been presented: that a train conductor slapped him hard across the face when a chemical reaction in his 'train lab' caused a fire, that he was pulled by the ear into a moving train by a conductor, and a bout of scarlet fever and recurring ear infections. Though his hearing was impaired from the age of 12, he said that it did not bother him, since it helped him concentrate. He invented the Edison battery, which made use of an alkaline electrolyte. At the age of 14, he saved a 3 year old boy -- Jimmie MacKenzie -- from being hit by a train. The father of the child (who was a station agent) was so grateful that he trained Thomas Edison to be a telegraph operator. This channeled Edison's genius towards the field of telegraph, and he produced several innovations in the field. The most popular of his inventions concerning the improvement of telegraph machines was the automatic repeater and the electric telegraph machine. He set up the world's first electric light power station in Lower Manhattan. With the invention of the phonograph in 1877, he acquired fame as The Wizard of Menlo Park. He formed the Edison Electric Light Company in 1878 in New York City. This was done with the help of several other financiers. He is also known as the first inventor to use the principles of mass production for inventions. He considered William J. Hammer as the pioneer of incandescent electric lighting. William J. Hammer was a consulting electrical engineer who assisted Edison in December 1879. He helped Edison with various experiments (phonograph, electric railway, telephone, electric lighting, etc), but primarily looked after the research on incandescent light bulbs. It has also been said that he tested about 6,000 vegetable growths. This was for the purpose of filaments to be used in his light bulbs. His mentor was Franklin Leonard Pope. He allowed Edison to live and experiment in his home in New Jersey. He also invented the carbon microphone between the period 1877-1878. This was used in all the telephones of the period. He was one of the pioneering researchers in the field of motion cameras and made one of the first designs for the same. Edison invented the forerunner of the modern tattoo machine! Despite his numerous brilliant inventions and innovations, several of his ideas were absolute duds. One of these was the idea of building houses that had everything molded from concrete -- right from the walls to the bathtubs. He set out to launch this project as a solution to the housing problems in New York by making them an affordable option for the common man. However, the idea failed and not a single house was sold from among the 11 concrete houses that were built. 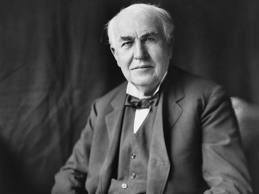 Edison also went on to build other concrete items, like pianos and cupboards. Unsurprisingly, they, too, found no buyers. Edison married his first wife Mary Stilwell at the age of 24. She was his employee. They had 3 children together. After Mary died, Edison married Mina Miller. An interesting fact about his marriage proposal to Miller was that he proposed using Morse code. Edison's untiring work was rewarded in the shape of the Congressional Gold Medal in 1928. Thomas Edison died on October 18, 1931, due to complications arising from diabetes. He was outlived by his wife by 16 years. Edison was raised a Christian, but his scientific, rational mind didn't agree with the numerous illustrations of unnatural concepts, such as miracles and rebirth. Due to this, he considered himself a Deist. He viewed Nature -- rather than any specific deity described by any religion -- as the ultimate power in the universe. Postmortem, Edison was inducted in the New Jersey Hall of Fame, the Entrepreneur Walk of Fame, and received a Technical Grammy Award. Thomas Edison was famous for the following words, 'Genius is one percent inspiration, 99 percent perspiration'. It shows Edison's dedication towards his work.